I always thought it was unusual that my sweet, small town Mississippi Grandma made sauerkraut every summer. We had absolutely no German roots and as far as I know she never was exposed to German food, but every summer the cabbage crop from her garden made its way into a big butter urn, packed with brine, on her screened back porch. She would leave the urn to ferment for a couple of weeks during those hot August days. On occasion, little Billy was spotted lifting the plate off the urn and sneaking a bite. Throughout the year, canned sauerkraut was a regular on our table. It was most definitely an anomaly, a German delicacy nestled among dishes of greens, fried okra, butterbeans, and fried chicken. Needless to say, I love sauerkraut and any dish containing it. Reubens have always maintained a prominent place of my list of favorite sandwiches. However, I’ve always preferred the turkey version instead of corned beef. I’ve recently jumped on the no-knead, Dutch oven, breadmaking bandwagon. I’m a little late to the game as bloggers have been making this bread for quite a while now. But, better late than never, right? Reuben sandwiches are traditionally made with rye bread, so I made a version of rye bread using the same technique. For those of you who have never tried this method of breadmaking, it is truly simple and foolproof. You simply mix the dry ingredients together, pour in warm water, stir until blended, cover, and leave on the countertop for 18 to 24 hours. It really does not require any kneading. The photograph above shows the dough after it has risen. As you can tell it’s a shaggy and wet dough. After it has risen, scrape the dough onto a floured surface. Roll the dough in the flour until you can form it into a loaf. Lift the dough onto a sheet of parchment paper. Score the dough and lift it on the parchment paper into a preheated Dutch oven. Replace the top to the pan and bake for 30 minutes at 450 degrees. Remove the top and continue baking for 10 to 15 minutes until the loaf is brown and crusty. 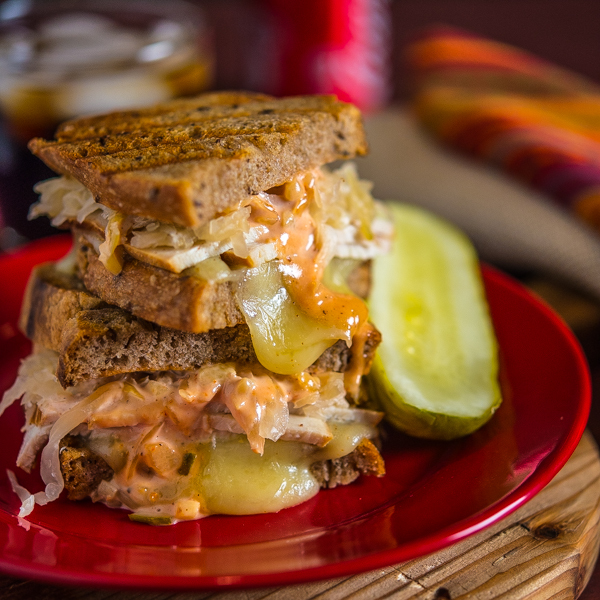 This hearty rye bread makes the perfect turkey Reuben. As you can tell from the photos, I like my Reuben with lots of cheese and dressing. They’re messy, but oh, so delicious! 1. Whisk flours, yeast, and salt in a medium bowl. Make a well in the center of the flour mixture and add water. With a silicone spatula, gently mix until water is incorporated into the flour mixture. 2. Cover bowl with plastic wrap and leave on countertop for 18 to 24 hours. 3. Preheat oven to 450 degrees. Place dutch oven with cover in oven and preheat for 30 minutes. 4. With a silicone spatula, turn dough onto well floured surface. Dough will be very wet. Turn dough several time to cover with flour, adding flour as necessary. 5. Place dough on a sheet of parchment paper and form into a oblong loaf. Score the dough with a very sharp knife. 6. Remove dutch oven from oven and carefully lift parchment paper with dough into dutch oven. Replace top and return to the oven. Bake for 30 minutes. Remove top from Dutch oven and continue baking for 10 to 15 minutes or until bread is golden brown. 7. Cool completely before eating. 1. Brush one side of each slice of bread with melted butter and place butter side down on a cutting board. 2. Spread dressing on each slice of bread. Build sandwiches by topping four slices of bread with two slices of cheese, sliced turkey, sauerkraut, and top with bread. 3. Preheat a large iron skillet, panini maker, or sandwich maker, such as a George Foreman grill. 4. Grill sandwiches until heated through and cheese is melted. 6. Spread dressing on other side of each slice of bread. I am trying this recipe now. You said do not overmix. Is there a reason why? Looks out of this world good. Can’t wait to make the bread recipe. I would love to make sauerkraut from scratch…do you have your Grandmother’s recipe for how she made it? If you could only see my baking supply pantry! I have so many ingredients, but not one ounce of rye flour. I just learned to make sourdough, and rye is also on my “must learn” list. With my German roots, you’d think I like sauerkraut. I don’t. Except for Reuben sandwiches or sauerkraut and ribs. Weird, I know. This sandwich is magazine perfect. Wow! Beautiful job on the no-knead bread. I love that technique. Soooo, when’re you gonna make sourdough? LOL! I’ve wanted to try a Rye bread for a while, thanks for sharing. I can’t wait to try the bread out and the sandwich looks really good. Pinning this. Great Reuben! I love this sandwich. And super bread. We’ve been making a lot of no-knead bread, although not rye – we should try that. We haven’t been preheating the Dutch oven, but putting the bread into the Dutch oven when it’s cold. This means we don’t get quite as crusty a crust, but it’s still quite good. And easier to use in sandwiches. Anyway, good stuff – thanks. My mouth is watering, Bill – this looks absolutely scrumptious! Your sandwich looks perfect……but, oh that bread!!!!! We love a good rye bread and this recipe looks so good and easy. Pinned this, and will be making after a grocery run! Thanks for sharing. OMG! I’m drooling!!! My favorite sandwich and I want to reach in the screen and grab it right now. Pinned. Shared. OMG!! !